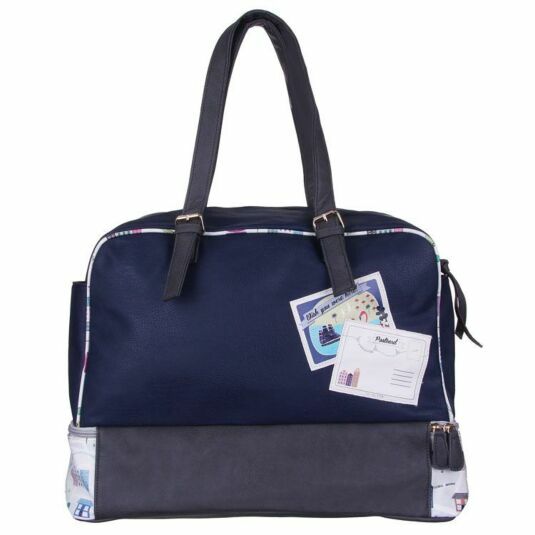 This capacious weekend bag is large enough to accommodate all your overnight needs, including slippers and a laptop! The exterior and the two open side pockets are finished in a deep blue. On the base, two front pocket flaps and piping joins are decorated in illustrations of the city, including a boat on the river and labelled buildings. 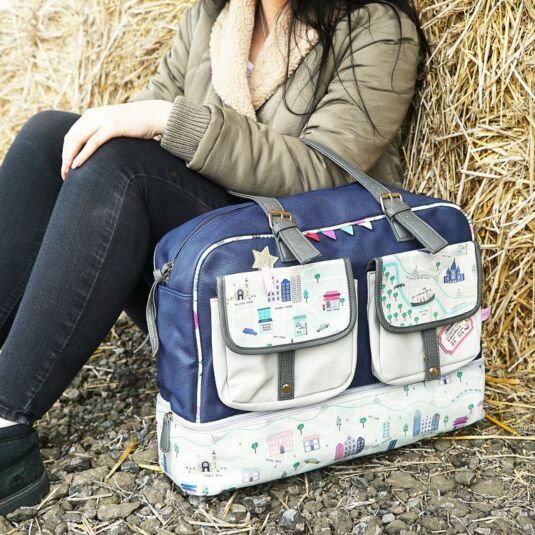 The bag features many appliqued added details, such as a gold glitter star which has an attached ribbon with the words ‘YOU ARE HERE’ printed on, multi-coloured bunting and an ‘ADMIT ONE’ zoo ticket. The base of the bag opens using the zip, making the perfect storage section for shoes or beach towel! The two pockets on the front close with magnetic poppers; they are perfect for storing sunglasses, notebooks or charging cables. Inside is lined with a bright eye-catching purple, there are three internal compartments; a zipped pocket for personal items, along with two open sections for a phone, cards or lip balm. 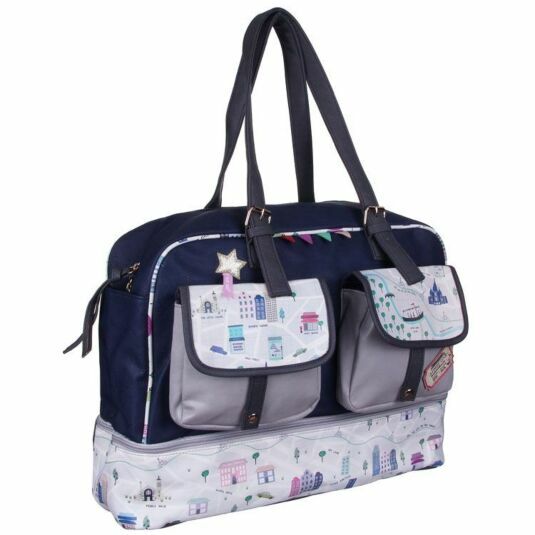 The bag has an adjustable grey shoulder strap that matches the two front pockets and zip pull, which closes your bag keeping all your items safe! This stylish weekend bag is made from realistic and soft faux leather, with a texture and patina that closely resemble the real thing, plus the added bonus of being cruelty free! This a great gift for seasoned travellers of all ages, including teenagers, mothers and grandmothers. This beach and city themed range from Disaster designs complements every wardrobe. The main colours used are muted yellows, greens and blues, along with details in a darker palette of brown and teal. These items not only make a statement when out and about but are ideal for any age, and make lovely gifts for travellers, teachers, students and trendy mums. 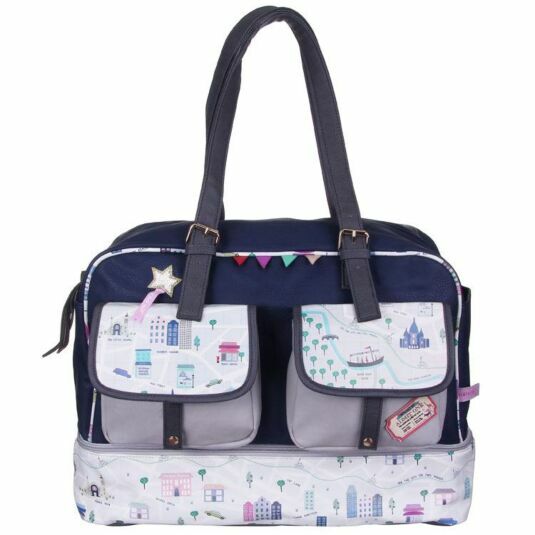 The range includes gorgeous makeup bags, travel wallets, bags and pouches, all incorporating either the beach or city theme. Welcome to the fashion world of Disaster Designs - the company behind best-selling ranges like Paper Plane, Dandy and Songbird. With over 20 years of textile design experience, House of Disaster (also known as Disaster Designs) never fail to come up with new, funky and simply gorgeous bags, fashion and household accessories. Born in the summer of '89 in a haze of tie dye and a tangle of dream catchers, Disaster has reinvented itself through the trends and fads of the last 20 plus years, defining itself always as an original purveyor of quirky and unusual things. Always true to the current trends and fashion must-haves, each collection from Disaster Designs is unique, decorative and aimed at stressing one's individuality. With designs ranging from vintage inspirations, through timeless elegance to the totally funky, you are sure to find something you'll love to show off on any occasion.